I 've been wanting to ink up my Sail Away boat for ages and this was the perfect opportunity! I thought if I sponged a simple sea and sky for a background, I could stamp the sailboat onto acetate and layer it over the top. This photo shows you the sponging. There isn't anything complicated about it at all - it's essentially three bands of colour. I swished the sponge across the card stock using a side to side sweeping motion. The sharp horizon line was made by holding a piece of paper over the sky area. The sea is highlighted with Whisper White craft ink dabbed on lightly with a piece of rough massage-style sponge. The card could have ended up looking too symmetrical - and I couldn't have that! - so I made a tab-style sentiment for it. And the verdict? Using acetate was brilliant fun and I can't understand why I don't use it all the time! Thanks Mandi and Chrissie for pushing me out of my comfort zone again! Cut a 9cm square piece of medium window sheet and stamp the boat image onto it using black Stazon ink. Set aside. Cut a 12.5cm square piece of Whisper White card stock and lightly sponge So Saffron ink across the middle of it. Add Marina Mist ink above the So Saffron being careful not to overlap too much as you don't want a green sky! Hold a piece of paper over the sky and sponge Baja Breeze ink over the rest of the card stock. Very gently add a little Tangerine Tango ink in the middle of the sky to give the illusion of sunrise. Add highlights to the sea if you like using a rough sponge and Whisper White craft ink. TIP: When sponging backgrounds I always pay particular attention to the edges of the card stock which gives it more depth. Hold the acetate over the background and pierce through both layers where you want the brads to be. Set silver eyelets into the background piece with a cropadile and then attach the acetate layer to the background by fixing brads through the eyelets. Stamp a sentiment and cut it out to make a tab. TIP: I always use my 1 1/4" square punch to help me with this. Stick the tab under the card with tape. Cut a 29cm x 14.5cm piece of Whisper White card stock. Score and fold in half to create a card base and attach the sail boat panel to the card front. Hope you've all had wonderful weekends. Spring has really taken hold here now and we're breathing the scent of spring flowers and enjoying the broods of ducklings on the river. The garden seems to have been taken over by Triffids and every time the children come in, half the outdoors seems to come in with them! I think it's time I stopped blogging now and removed some of it! Thank you so much for your comments - I really do appreciate them. I shall be back tomorrow with Easter projects and I'll hope to see you then. I've been looking at that boat stamp in the mini... I may just have to get it! A beautiful card, I love everything about it. A beautiful card and so perfectly executed. Thanks also for all the detail very helpful. You should frame this it's so pretty. Oh Vicky, trust you to not only come up with a fabulous acetate card but to enjoy making it too Lol.Love the sponging. This is gorgeous! I really love how well your sponging came out. Such a prefect masculine card. Great way to start the week. 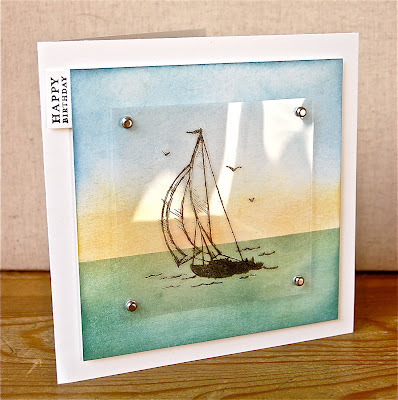 I am going to book mark this now so I can CASE it when my sail away stamp arrives this week! I love it! Love the muted colors, the design and your clever way of lifting the acetate up! Another beautiful card....I love it !!! This is beautiful Vicky, I am going to have to CASE this. I love the three panels of colour. This is just stunning Vicky! Love how you've stamped the image onto the acetate and layered it over the sunset background! Might have to think about getting this Sail away stamp now! You are such an inspiration...thank you! What a wonderful CAS card Vicky. Love how all your masculine cards are becoming LIM cards...just goes to show the CAS style works well for chaps cards. How clever you are, Vicky! The background is beautiful and your "popped" acetate is lovely. This challenge really has me stumped! Vicky, this is absolutely beautiful!! I love the background...and the boat seems to float on the water! Vicky - this is just brilliant!! I really like the seascape you've made, and the sailboat is a lovely image. 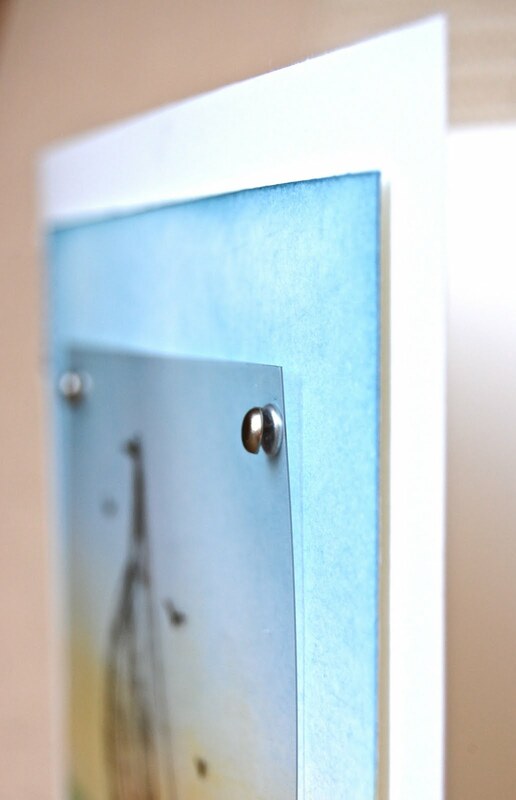 Great way to mount the acetate too! What a stunning card! I am a sucker for any kind of sailboat and your card has me drooling! Will have to remember this technique...thanks for sharing! Fantastic idea to use the clear foil on the card! The card looks like a painting, wonderful, Vicky!